HAPPY HAPPY NEW YEAR!!! Also, Happy Birthday to Miss Joanna!!! I wanted to thank her also for invited me to be in this FUN blog hop!! So if you have arrived here from the talented "Peachy Princess" Angelica, then you are headed in the right direction! For my card I FINALLY used Birthday Bash cartridge! For my cute lion's face I used Peachy Keen's "Happy New Year Faces"! That perfect sentiment is "Girls Just Wanna Have Fun" by Pink By Design! I hope you enjoy the video showing how I designed this card in my Gypsy girl! ;) ENJOY! The next blog you will be visiting is the talented Erin Lee! P.S. If you would like to pre-order any of my new stamp sets, you can do so HERE! ;) and you can have a better look at each set! OMG, this is an AMAZING giveaway! I would LOVE to have those stamps and would use them all the time! Hope the random machine likes me! LOL - My resolution is to be ahead of the game when it comes to my cards I create to sell. I don't want to be rushed like I was this past Christmas! I will be making Christmas cards for 2011 starting NOW! LOL Thanks for the giveaway! You gotta love that face on the card. I would definitely love to win your stamps Emma you have them packaged so beautifully. Congratulations on your new stamps. HOW ADORABLE!! I love this card, and look at the adorable face,LOL.. great job here. I am already a follower of your blog, love your blog candy, no I dont have these stamps, they look amazing. This year, my resolution is to work on mine and my daughters health, get up and be more active, oh, and get some more projects posted to my blog! this card is sooo cuteee!!! I would love to win your stamps I think they are GREAT!!!! That is an awsome give away....You are great Emma! My resolution is to get more fit, hopefully I can keep it. Off to the next blog! Super cute card and I love these stamps. I would love to win these!! Umm, My resolution is to work less and enjoy more! Spend more time with family instead of at work...I would also like to shed 20 lbs.. Thanks for the chance to win! What an amazing giveaway..well i just bought one set of these and congratulations on this new adventure.. my new year resolution is to devote more time to crafting - especially creating scrapbook pages of my beautiful 2 year old daughter..
What a wonderful giveaway! First Happy New Year! My new year's resolution is to bless others with cards more and encourage more people. OMG Emma! I absolutely love the font of your stamps!! Gotta win these!! My new years resolution is #1 to be the best wife EVER and #2 to actually print my pics and SCRAPBOOK!! Happy new year!! what a great giveaway.. I love the card.. my new years resolution is to craft more and loose some weight. i hope i stick to it.. happy new years.. This is such an awesome giveaway!!! Thanks for the chance to win and Happy New YEar! My goal is to keep walking through every door that opens up to me. If I don't succeed, I will just keep trying until I do. But I will also allow God to lead me as I follow His perfect will. I wish everyone a wonderful New Year! I love all of your projects and especially your gypsy videos. My resolution is scrapbook more and use my gypsy for my projects. I don't have any sentiment stamps so this would be an awesome win. Thanks for the chance to win. Happy New Year! Great project as always Emma!! My new year's resolution is to challenge myself more creatively and maybe have the confidence to start to enter some challenges. What a cute card! I love the Party animal sentiment!! I am so happy you came out with your own stamps, I love them and can't wait to see what you create next!! TFS and Happy New Year to you and your family!! How awesome are you to giveaway your beautiful stamps. I bought two of them already and will be saving up for the other two. :) THANKS EMMA!!! My New Years resolution is to get my home and head organized so that I can spend more time doing what I love - spending time with my hubby and kids and CRAFTING! I've already started this process today and donated 4 bags of toys, clothing and shoes to the Goodwill. I also downloaded and started using the Motivated Moms 2011 ebook chore list. I even have my girls helping me. It's going to be a great year! Great and big giveaway. Your card is so cute. One of my resolution for this year is to make more scrapbooking, I'm so behind, that I need to work on it. Happy new year. A great giveaway. My resolution is to blog more and craft more. Happy New Year!These stamp sets look really fun to use. This blog candy would make my New Year very happy! WOW Emma such an amazing giveaway and card! My New Year's resolution in to craft more and eat less!!! What a very fun & cute card. Love the little face on her. My New Years Resolution is to get more scrapbooking done. I have years......to do. uug! Best wishes to you and your family this New Year! Your lion really is a Party Animal, love the shoes. One of my resolutions is to get my craft room set up and make time for crafting at least once a week. Oh how cute your card is Miss Emma. I love it. How sweet of you for your great blog candy. Thanks for sharing and Happy New Year to you and your family. a very happy year with your family. I hope you keep inspiring us with your great cards an layouts! And congratulations with your stampsets. They look amazing! What a cute card. Wow, what a great prize. Thanks for a chance to win & congrats on your own stamp sets. a very cute card .I love your blog. thanks for the chance to win your stamp sets. Hi Emma, I love your videos and your cards. I've learned so much from you! Best wishes for you and your family for 2011. I love your stamps btw and I hope international can enter as well ;-) Oh, my new years resolution is to make more time for crafting! Happy New Year! Your card is just to cute! WOW! I would love to be the lucky stamper to win your stamp sets. I just love all the sentiments and could really use them. Thanks for a chance. That is a great give away I would love to win that. I want to spend more time in my craft room this year, and use more of my carts I tend to use the same ones.Thank-you for a great blog. What an amazing giveaway. Someone will be very lucky. Great card, very inventive and smart. I love your blog and your projects. Thanks for your time and talent and Happy New Year. Finnish my weight loss journey. (70 down 30 to go) and start my own blog...........scary. Your stamps are wonderful. thank you for the opportunity to win some of them. Wow what a awesome give away. You have some really cute sayings on your stamps. My resolution this year is to ....gulp.... spend less on scrapbooking. I don't know if I can do it. Thank you for all your videos, you really make things look so easy and I am creatively challenged, so please keep the videos coming. My New Years resolution is to force myself to do layouts. I am more of a card maker and I need to start doing layouts of my kids. Oh my what an awesome giveaway. You are sooo generous! Love your card and video. So glad I found your website! Will be back to visit and learn from you as I just got a gypsy for Christmas. This card is fantastic!!! Love the hat,the drink and the high heels!!! So awesome! I just love your creativity!!! And I'm excited about this giveaway too...I won't lie!!! lol Happy New Year Emma!!! TFS the video too! Love the card! My resolution is to end the procrastination and just get "er" done!! What a cute card and sentiment! My resolution for 2011 is to get my scrapping area clean and re-organized by the end of January! Thank you for the chance to win your AWESOME blog candy! Would love to have those! The lion is gorgeous and the face tops it off. I am a follower but do not have any of your stamps - they look great BTW! TFS! I have lots of New Year's resolutions, but the big ones: organize my craft area, and lose weight the healthy way, exercise more. My only newyears resolution this year is to visit my loved ones more. I have in the past year been really lonely living in a new place where i had very few people i knew. That made me realize that i wanted to move back home and home valuable my friends and family really are. So now i finally got to move back home and i WILL get around to spend more time with my friends and family =) So happy newyear to one and all. My resolution is to hear the word at DAB on itunes and finish Couch to 5K. Every day of 2011. ksmile123atcomcastdotnet. Thanks for the chance to win. Great card, awesome video. You make it look so easy. Thanks for the chance to win an awesome prize. New Years Resolution, QUIT SMOKING!!! That is my number one. I will do more scrapbooking and that should keep my mind off of it. My New Year's Resolution is to stay in touch more with my friends. Oh wow, I just love your new stamps. This is an Awesome giveaway! I love all your projects! Thanks for sharing today! My New Year's resolution is to use up some of my single sided DCWV stacks to make room for more, haha! thanks for the chance to win your new stamps ! they are awesome ! Many resolutions , but more exercise is the number 1 ! Great card ! Amazing giveaway - winning would be a wonderful way to start 2011. My new year's resolution - using my craft room at least an hour a day. Happy New Year! I love you card (as usual, LOL) and you giveaway is great! I would LOVE to win, thanks for the chance!! My New Year's resolution this year is to enjoy life to the fullest and to not sweat the small stuff. Life is too short! Such a cute card! Very creative! What a great giveaway..thanks for a chance to win! My New Year's resolution is to exercise more and scrap more..I am so far behind. Happy New Year! Congrats on new venture in teh stamp world:) Love the lion, I don't think is going to make through the entire hop!!! No resolutions, just living life this year and having fun while doing it!! Love your new stamp line. Would love to win these as they will be on my wish list for awhile. Your card is awesome with the Peachy Keen stamp face. My daughter loves your video and got extremely excited when she heard you were giving away your stamps. We have our fingers crossed. Happy New Year Emma. Great card and great giveaway! Love the new stamps! One of my many New Years resolution's is to not get stressed about what I haven't scrapbooked and focus on getting done what I can! Such a super cute card. I love that little lion and his face. For New Years, we just stayed in and actually watched the ball drop live on Fox News, since we are on West Coast, then went to bed. For 2011, I just want to save money and be happier. 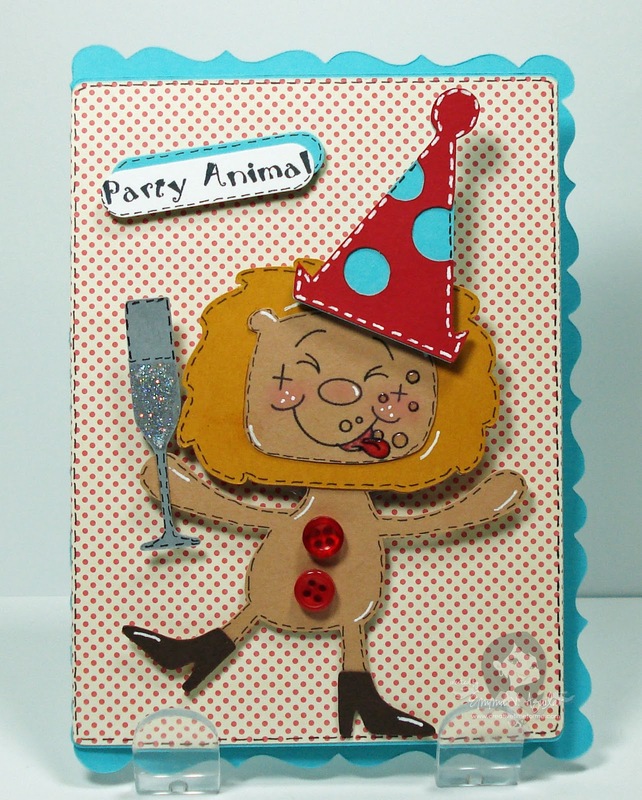 Your party animal lion is so cute. He makes me chuckle because he is so silly. Awesome candy, congratulations on your new stamps! Thank you for sharing your projects with all of us. Love your blog!! I resolve this year to create more challenge enteries for the many challenge blogs and blog about those projects. Wow Emma, seems like you are starting the year off right! Congrats on your new stamps and I wish you nothing but greatness for the rest of the year. Mu New Year's Resolution is to lose 75 lbs and post more onto my blog. Super cute card - as always! The PKS face is too cute for that little lion! Congratulations on your new stamp sets! They are beautiful! My resolution this year is to find better balance in my life. My resolution is to organize my scrap room so I can scrap and more cards more efficiently. Love your videos. That is such an adorable face. I love peachy keen stamps and I would love to win your stamps too! My resolution is to TRY not to wait to the last minute to complete my projects. Organize my scrap room and then spend more time with my mom. xoxo. Emma have a wonderful New Year!! Your card is adorable! I love the PK face you used. Congrats on your new stamp line...I love all the sentiments and would love to win! I love your card. YOu did a great job. Congrats on your new stamp line. YOU have done an awesome job with your stamps. I love your card Emma!! That little lion is adorable!!! I have got to get that cartridge!! I would love to win your stamp set!! Thanks for the chance!! Love the lions face. I resolve to ask for help more. What a cute card! I love how it looks like he's trying to lick up the bubbles! Too Cute! Good luck on your new adventure. I also wanted to say I admire what you said about the other stamp sets. It would be nice to have different font options. I'm glad I had an opportunity to find your blog. Happy New Year! Oh my goodness that lion is adorable. Congrats on the new stamp line. oh emma, you crack me up! this card is way too funny! I didn't even realize I had that image! One of my NY resolutions is to make birthday/anniversary cards for all my family! We have a big family so I should be a pro by the end of the year! A cute card as always Emma! Such a wonderful giveaway! My new years resolution , besides the usual "I gotta lose weight" is to reorganize my craft area and to make more time for crafting!!! Thanks again! Super cute card, as always!! My New Years Resolution is to spend more time for myself doing things I enjoy. I got Birthday Bash for Christmas and I LOVE it! My resolution is to start blogging again! It has been since September that I had my last post! Thanks for the chance for such a great giveaway! New Year's Resolution is to find balance in my creative world! Love these sentiment sets! I've always passed over sentiment only stamps collections because, well they're sentiments and not images. Now I find I'm forever wishing I had a collection of sentiments that I can turn to without searching every stamp set hoping a sentiment is included that will work. Guess that should be a New Year's Resolution, too.... build up a collection of sentiments :) Would love to start with yours! Love that card!! Now you have made me want that Birthday Bash cart! Enabler alert! LOL! Seriously, your card is fantastic!! I learned some things about the gypsy watching the video! Thanks! My New Year's Resolution is to look for the silver lining of every situation!! Cheers! Love your video and card. I don't have a Gypsy yet, but love using my Cricut. I don't make New Year's resolutions other than to do more crafting lol. Fantastic blog candy ... would love having and using them. TFS. Thanks - I have already all 4 sets but that you for the opportunity to win them! First of all Happy New Year!!!! My New Years resolution is to eat healthy and exercise.. also to try and visit more of my followers blogs and show them some love on their talent. Have a wonderful day. HI I LOVE YOUR GYPSY VIDEOS. IHAVE YOUR DVDS. I HAVE LEARNED SO MUCH FROM YOU. WHOULD LOVE TO WIN YOUR STAMP SETS . What a great give away. Thanks for the chance. That card is adorable. How cute is he..nice job!!! What a wonderful giveaway, congrats on your new stamps and thanks so much for giving us the opportunity to win! Hi Emma! What a great card! My New Years Resolution is to come up with a plan which will balance out my everyday schedule. I need to come up with a workout/scrap/me-time schedule after working and coming home and cooking! LOVE LOVE LOVE your card!!! I am loving all the great ideas for Birthday Bash - other than birthday cards!!! My New Years resolution is to get caught up on my scrapbooking! Great giveaway too! Thanks for the chance to win! What a fun card creation! I just discovered your blog on this hop and am now a follower. My new year's resolution is to practice "living in the moment"! Cute card. (I wonder how many are feeling like him this morning?) I don't really have any NY resolutions, other than just live each day one day at a time & make the best of each one. Oh, Emma, your ideas are wonderful. I have one of your DVD's, and would love the others, too. PLUS, your stamp sets are awesome. I have challenged myself to stay ahead of my card needs, yet still "match" them to the person. A HUGE challenge for me. My new years resolution is to buy less and create more!.. I have a lot of product and get more after visiting blogs and watching videos.. so I'm going to try and slow it down..lol.. Such a cute card and thanks for the great video! Love all the stamp sets, so I will be crossing my fingers! This card is adorable!!! Love the face! My new years resolution is to get back in shape and lose some weight! What an awesome giveaway! I would LOVE to have all your stamps!! What a great giveaway! I LOVE your new stamps and I am so happy your are going in this direction! My New Years Resolution is to loose weight and be happy. Happy New Year!!! LOL, too cute! Love the card! My resolution is to do more challenges. Thank you so much and a Happy New Year to you!!! My resolution this year is to lose some weight! Guess I'm not the only one, lol. awesome giveaway! My new years resolution is to spend more time crafting. Wow...fantastic giveaway! I love your card. It cracks me up. He definetely had way too much bubbly. My resolution is to catch up on LOs. I have already started and have done 3 in the last 2 days. Happy New Year! Thanks for the chance to win. They're great stamps! Too stinking cute Emma!! LOVE him!! I'd like to get more layouts done this year!! It's sad to say, I'm 14 years behind!! ;( Thanks for sharing your card.. and the chance to win such a generous prize!! This card is sooooo adorable! I love it! My New Years resolution is to get caught up on my scrapbooks and spend more time crafting! Thank you for the chance to win! I did not even know you had your own stamp sets. This is so exciting! I will have to say 2 resolutions: Num 1.To keep my mojo running in order to keep my scrapbook pages as current as possible. And Num 2: Give some T.L.C to my etsy page. thanks for opportunity again Emma. oh Emma, another awesome idea. Love this card. TFS the video. I learn so much from them. All I have to say is -- WOWWWWW! What an awesome giveaway! I have a few New Year's resolutions this year...but I think my biggest one (or ones) is to try to reduce the stress in my life (mainly from my job, lol) by crafting more :) It has been hard these last few months to find time to sit down, relax, and just "play" with my Cricut, so it is definitely something I'd like to work on this year :) Happy Blogiversary/Birthday to Joanna and thanks for the awesome giveaways! Love the lion card, Emma! I am also very excited about your new stamp line. Haven't purchased any yet, but I have hinted to hubby about a Valentine's gift (Lol). Happy New Year Emma...I love your videos. My resolution...to take a deep breath and enjoy life. One of my goals is to finish my oldest nieces scrapbooks. Another cute card as always Emma! I did purchase 2 sets of your new stamps and cannot wait to get my dirty little hands on them!! I do not have a New Years resolution yet but do know that it is going to be a year of change!! This lion is so...crazy! From the boots to the face, to funny. Thanks for a chance to win your awesome stamps! Happy New Year Emma.. Great Video of course they always are! I don't have any of your Stamps or anyone's Stamps for that matter. I'm just starting out. My New Years goal is to learn my New Cricut and learn to do Layout's to make my Grandson an Awesome book. Actually all my Grandchildren one day. What a great card. I love your new stamps sets too. I would love to win. Thanks for the chance. I want to actually create, not just read about, my cards ahead of the time I need them. I want to take time to learn new techniques and enjoy the crafting. Such a fun stop on the blog hop. Thanks for the tips for my Gypsy. FAB giveaway. Spend more time crafting, thats my resolution. Card is adorable as always. They give me so much inspiration. Awesome giveaway, thanks for the opportunity to win, not lucky in that area! My resolution is to learn my gypsy, make handmade cards for everyone I send to, and enjoy each day as it comes. Happy New Year! God Bless! What an adorable card. I do not have the Birthday Bash cart. But I think I will need to get it. Your work is always amazing!!! I cannot believe that you are offering your stamp sets as a giveaway! Wow Oh Wow, how lucky someone will be. My fingers are crossed it is me! Happy New Year! Oh Emma, your card is so cute! I love the PKS face on your lion. TFS all your wonderful creations. I have already ordered the You Had Me at Chocolate set but would love all the other sets. Loving your card today. MY RESOLUTION for this year is to be healthier. Happy New Year! Your card is darling. I am looking forward to more adorable creations from you in 2011. Adorable card and awesome giveaway!!! My New Year's resolition his year is organizaton in all aspects of my life. Seems like the last few months everything is in disarray and it needs HELP!! Thanks for the chacne to win! What a cute card .... My goal for 2011 is - getting more organized in my scraproom and having more friends over to scrap with. Just love your stamp sets you came out with..I sure hope you will have more to come. Thanks for the chance to win them all!! Love your card Emma and love your new set of stamps. For the new year, I was on Yahoo Messenger chatting with my sister while watching the celebration in New York on the TV. Happy New Year to you and your family. Love your party animal so cute. Thanks for the chance to win your stamps. Congrats to your new stamp line... they are so cute. New Years Resolution? Walk my puppy more (and me too). really loved the card and would love to win the stamps! How did you get started making your stamps to sell? Ideas? My resolutions only seem to last 2 weeks into the new year, so I don't make them. (Out loud anyways!) Being the best "me" is one I always try to work on. So I guess I'm a work in progress. Have a wonderful new year and thanks for the opportunity to win such a generous gift. Oh my goodness I would love to win your stamps. What a wonderful prize. Your Party Animal is adorable. I should be making cards but I am hopping. I have this NY PK stamp set. So cute. I love red too. Very pretty. I love Cricut Search too. Ok on to the hop. I hope I win!!! I love your card!! Birthday Bash is definitely a cart I must get! One of my New Years resolutions (I have a list on my blog!) is to be more involved with blogging. I want to get my work out there! Your stamps would definitely enhance my projects! Awesome giveaway! My resolution is to fit in more craft time and to take one class per month at my local scrapbooking store! Happy New year Emma!!! What a cute card!! Love your Gypsy cover!! Love your card thanks for sharing and Happy New Year!!! That little guy is so cute! I love it! Cute card!!! I LOVE your new stamp sets! SOO happy you have stamps! I love them all, hope to win! Cute card. Thanks for the chance to win the stamp sets! Happy New Year! Emma, everything that you do is always incredible and I'm always left with that wow factor...Great job!!!! Wow!! Congratulations on your new venture Emma!! I love all of your new stamp sets and I hope to get them all soon!! Thanks for the opp to win this great prize!! My New Years resolution is to lose weight!! ughhhhh!! lol!! OMG.. What a great way to start off the new year!! Awesome give away.. thanks for the chance to win!! I love your card Emma. What a great giveaway. My resolution for 2011 is to finish off projects before starting another and crafting more. Thanks for the chance to win. my new years "EVOLUTION" haha (inside joke)I mean resolution is to get healthy and scrap my summer trip to chicago when i visited my bff and we went to CHA and is saw you in the peachy keen booth! woo hoo..
What a cute card! I really like your projects and what an awesome giveaway. These stamp sets look fun! TFS and the chance to win! I LOVE, LOVE, LOVE your new stamps. My new year resolution would be to be more active on my blog and make enough Christmas cards throughout the year to give out all homemade next year. We will see! Thanks for all of your hard work! Love the card! What a great giveaway you are offering. I just want to thank you for all the tutorials you have posted. Thanks to you, I can use my Gypsy and I love it! WOW! I wanna WIN... I wanna WIN!! I LOVE you stamps Emma, congrats on all your success! My New Years resolution is to lose all my pregnancy weight and continue to be the best mom I can be to my precious little four month old boy! I watched the video on YT last night when I got home from work,lol! What an adorable card. I just love your stamps Emma! Wow! What a great giveaway!!! My new year's resolution is to craft more and spend more time doing things that enrich my life rather than just stressing or watching tv. I love the sentiment with your lion! Super cute! My New Year's resolution is to eat healthier and exercise more (typical resolution, I know!). I don't have any of your stamps yet and I would LOVE to win some! I'm going to scrap more in 2011 ~ that and use up some of the supplies I have on hand. Here's to a WONDERFUL, CREATIVE 2011!! 1) loose the 10 lbs that has crept back on. 2) Make more time for crafting. 3) Dontae cards to Card Cupids. My fav. New Years Resolution is to improve myself as a person, be better than the year before. My resolution is to be a better wife/mom (not that i was a bad one!) and to make more time for crafting. OMG!! What an awesome giveaway!! I do not have any of your new stamps sets so this would be so great to receive. I have a few New Years resolutions. Hopefully I will stick to them. Such a cute card. My resolution is to get to a healthier weight and focus on my new business more than I did last year! Great card Emma! Wonderful prize! Thanks and Happy New Year!